The project goals include a gallery show and a book. You are strongly encour­aged to read all of this sec­tion before your OKIE-X por­trait sit­ting. Just curi­ous about the project? Please see the General FAQ. I want to par­tic­i­pate. How do I qual­ify? per­form in pub­lic or make your music avail­able to the pub­lic, either via phys­i­cal media or online. Artists should fill out the Artists’ Survey before sched­ul­ing a sit­ting. How long are the por­trait ses­sions? Shoots typ­i­cally take 5 – 10 min­utes per sub­ject. You are wel­come to stay and watch me develop the neg­a­tives; allow about one hour extra if you want to see the dark­room process from start to fin­ish. When is the cut­off for par­tic­i­pa­tion? The por­trait phase will last through 2016 . At this time the cut­off is unknown. However, that could change any day. You should reserve your spot sooner, rather than later, if you want to par­tic­i­pate. Wear some­thing you’d like to be pho­tographed in. Many sub­jects wear the same thing they wear on stage. Some bring sev­eral cos­tume changes. Feather boas, loin­cloths, and glit­ter all strongly encour­aged. Bear in mind that x-ray film is blind to red, so any red clothes, makeup, or props will be black or dark grey in the final black-and-white image. This is not a pro­hi­bi­tion on red; just don’t expect it to ren­der as medium-grey as it would on mod­ern panchro­matic films. May I bring my (gui­tar) (drum) (dog) (spouse) (bowl­ing tro­phy) (Ouija Board)? Feel free to bring an instru­ment or an object of per­sonal sig­nif­i­cance. Spouses, boyfriends, girl­friends, and pets are wel­come. Firearms are not. The stu­dio is in Norman, Oklahoma. Please use the con­tact form at the bot­tom of this page to request my stu­dio address and phone num­ber. When is the stu­dio avail­able? The stu­dio is set up most week­days, and if it isn’t, I can have it oper­a­tional with an hour’s notice. Tell me when you are avail­able and I will work with your sched­ule. All por­traits are by appoint­ment only. When will I get to see my por­trait? Will I get a copy? I’m not show­ing the final images to any­one out­side the stu­dio at the moment, but hope to do so as the project nears com­ple­tion. You will receive a dig­i­tal file and a lim­ited license for your press kit. I live with a cat, so if you’re aller­gic, you may want to take appro­pri­ate mea­sures before vis­it­ing the stu­dio. … with more sched­uled soon. When will the por­traits be shown? Where will they be shown? The gallery show should occur in the 1st or 2nd quar­ter of 2017 , with the loca­tion to be announced as the date approaches. At this time I don’t know when or where the show will hang. I will announce it on social media and also here when I know. The best way to stay updated on OKIE-X is to sign up for the newslet­ter. If you’ve sat for the project, please ensure that I have your cur­rent con­tact infor­ma­tion. What’s the deal with x-ray film? I thought x-rays were dan­ger­ous! It’s sold in large sheets. I buy 8×10″ film in boxes of 100 and trim it with a guil­lo­tine cut­ter to fit my 4×5″ film hold­ers. It’s orthochro­matic: it has a greater spec­tral sen­si­tiv­ity than really old mate­ri­als, e.g., wet plate col­lo­dion, but it’s still not sen­si­tive to all vis­i­ble light, like mod­ern panchro­matic films. As of May 2016, the film I use is sen­si­tive to blue and green light, but blind to red. Because it’s ortho, I can work with it under a safe­light. The final image looks dif­fer­ent from con­ven­tial film because of the film’s inabil­ity to see most of the col­ors vis­i­ble to the human eye — so red objects are very dark, and minor blem­ishes, freck­les, and other facial fea­tures are more dis­tinct. Most x-ray film has emul­sion on both sides — twice the emul­sion, half the patient expo­sure to hard radi­a­tion. The film I use began the project with has emul­sion on only 1 side, and, like mod­ern panchro­matic films, has an anti-halation dye layer on the back. In May 2016 , I switched to con­ven­tional x-ray film. The emul­sion is very soft and requires care­ful han­dling. What kind of cam­era are you using? I’m mak­ing the por­traits with a cher­ry­wood Wista 45DX. It folds down quite com­pactly and weighs less than a 35mm SLR. It has a leather bel­lows, an extend­ing rail with rack and pin­ion focus, and numer­ous front and back move­ments (tilt, shift, rise and fall, and swing), which allow var­i­ous focus­ing effects and per­spec­tive cor­rec­tions. I recently con­tacted Wista, who told me the cam­era was man­u­fac­tured in 1984. Beginning in April , I changed lenses, as noted in the updated infor­ma­tion below. The lens is a 105mm ƒ/3 250mm ƒ/4 “in bar­rel” brass Petzval for­mula lens, roughly 150-years-old. Most likely, it was a magic lantern or pro­jec­tor lens. It has no aper­ture con­trol and no shut­ter. I’ve fit­ted an old Packard #6 pneu­matic shut­ter to the lens hood to con­trol the expo­sure and to fire the stu­dio lights. I chose the Petzval for its sharp cen­ter and “swirly” out-of-focus periph­ery. The lens’s dream­like, sur­real look can­not eas­ily be repro­duced by con­ven­tional means. What are you doing to pro­mote the project? I’m using all the usual social media chan­nels, along with directly con­tact­ing the musi­cians and talk­ing to the pub­lic. Additionally, I am in dis­cus­sion with a major local daily news­pa­per and a local tele­vi­sion sta­tion to do sto­ries on the project. More on that as things develop (in every sense of the word). I’m not a musi­cian, but I’d like to help. You can help spread the word by telling your friends about OKIE-X and by link­ing to this FAQ on social media. If you are a busi­ness owner and would like to dis­cuss cor­po­rate spon­sor­ship, please con­tact me. 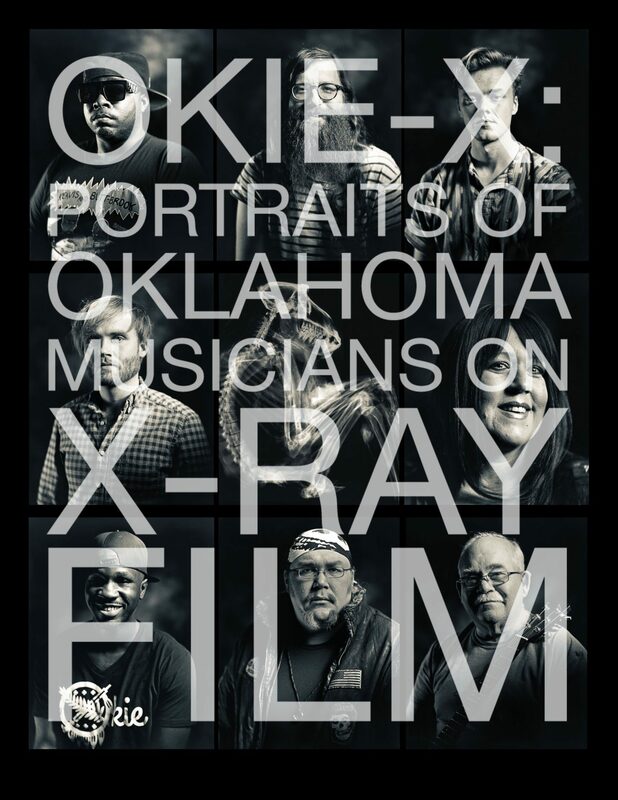 *Type any addi­tional ques­tions you have about the OKIE-X Project here. *Terms of Service and Privacy By sub­mit­ting this form, I accept the Mercury Photo Bureau web­site terms of ser­vice and pri­vacy pol­icy.